This is a terribly complex genus with many interesting species in North America. A good revision was done by Heie (1979), and followed by a couple more papers in the 1980s, which together gathered a lot of information and specimens from all over the world. He also established a nice subgeneric classification. His work was hampered somewhat by relatively little material from western North America, especially of the subgenus Kakimia. 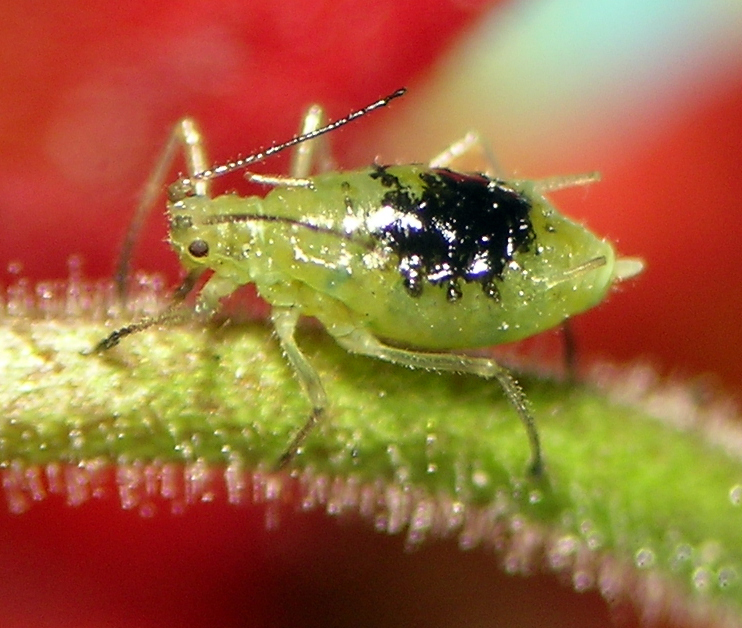 For many years I traveled around collecting Nasonovia (Kakimia) aphids, mounted them, and simply put the name ‘Kakimia‘ on slides and filed them away. Early in 2018 I finally rolled up my sleeves and sat down to sort all that material and see whether I could gain the confidence necessary to place species names on more material. I’m pleased to report that I did actually make progress! See below for some comments. In the end I placed species names on many of my slides, which will be reflected in the collection database once I post the 2018 update. I also did some sorting of material that still lacks species names, but at least I feel some confidence in grouping the samples together and that future study might allow species names. 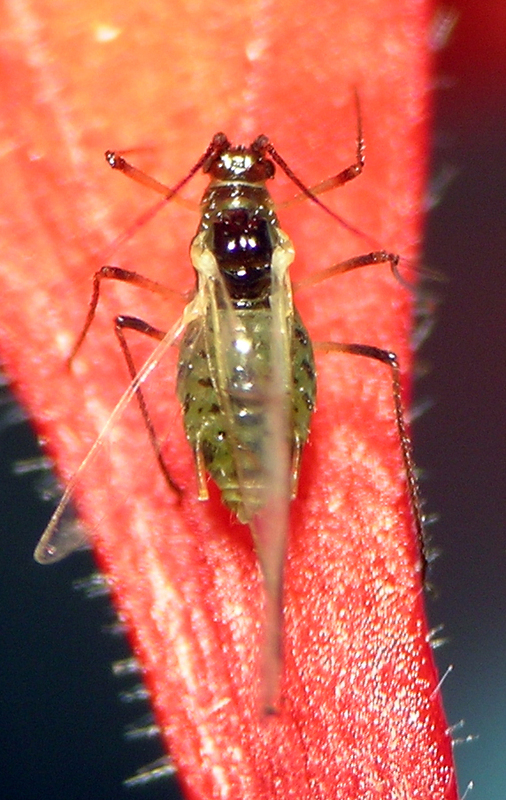 The dogma passed down through Heie and others is that this species is similar to N. (K.) cynosbati (see below) but feeds on Orobanchaceae (genera such as Castilleja, Mimulus, Pedicularis). Looking at all my material from these plants and from Ribes, I am sticking my neck out to put ‘alpina’ on many of my samples from Orobanchaceae plus some samples from Ribes, especially from Ribes cereum. All the material at hand makes it fairly easy to recognize this taxon as distinct from something I am labeling as N. (K.) cynosbati and from the related species (1, 2, more?) that live on Saxifragaceae. In saying that N. (K.) alpina lives on both Ribes and Orobanchaceae, I’m implying that it is heteroecious, migrating from Ribes to Orobanchaceae, and in fact such is my current hypothesis. 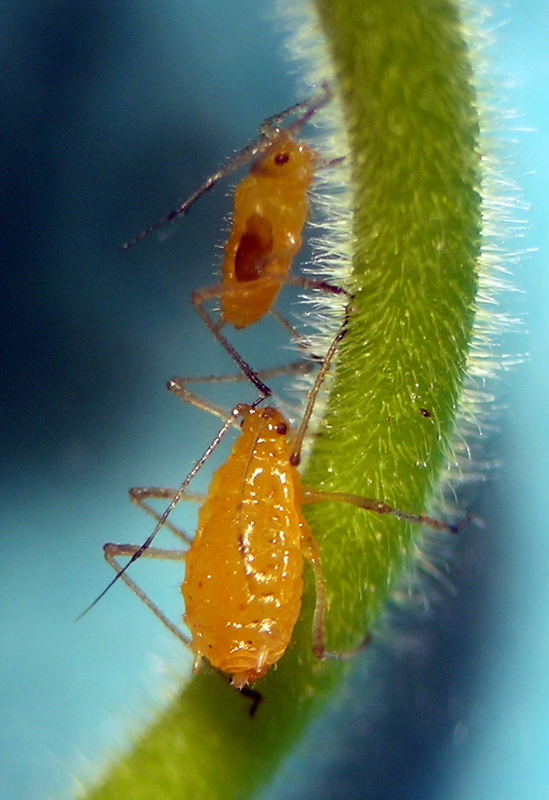 This makes a lot of sense based on the habitat types that I find this aphid on both groups of plants, and the morphology is strikingly similar on both plant groups as well. All this said, I also have some samples of aphids from Orobanchaceae, especially Mimulus, that are clearly not N. (K.) alpina and are still filed in my collection without species names. I will strive to get photos of N. (K.) alpina in 2018 to post here for your information. This is a very common species across much of North America on Aquilegia (columbines). It lives on both ornamental plants as well as native Aquilegia in the mountains. It is distinctive for its dorsal pigmentation in the apterae and for its dedication to its Aquilegia hosts. 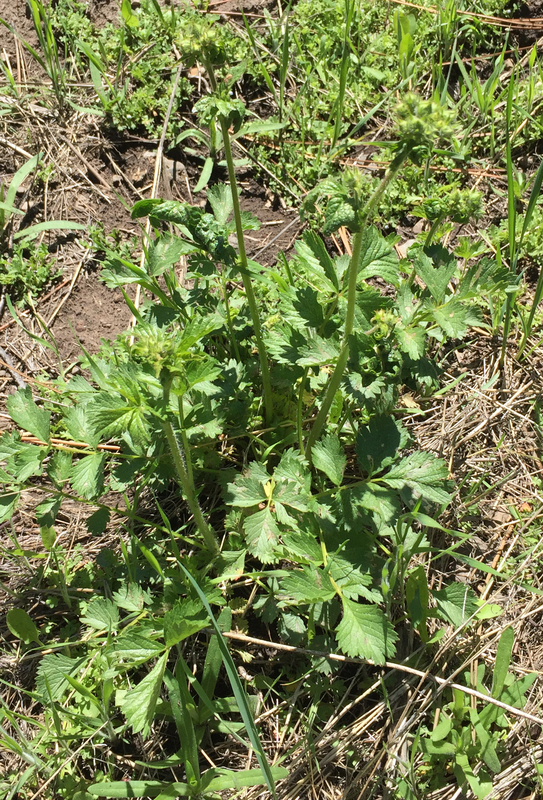 I often walk by this species in the field because it is so common and easy to recognize, but I so far have material from Washington, Oregon, Idaho, and Maryland. Nasonovia (Kakimia) aquilegiae apterous vivipara with one broken antenna. 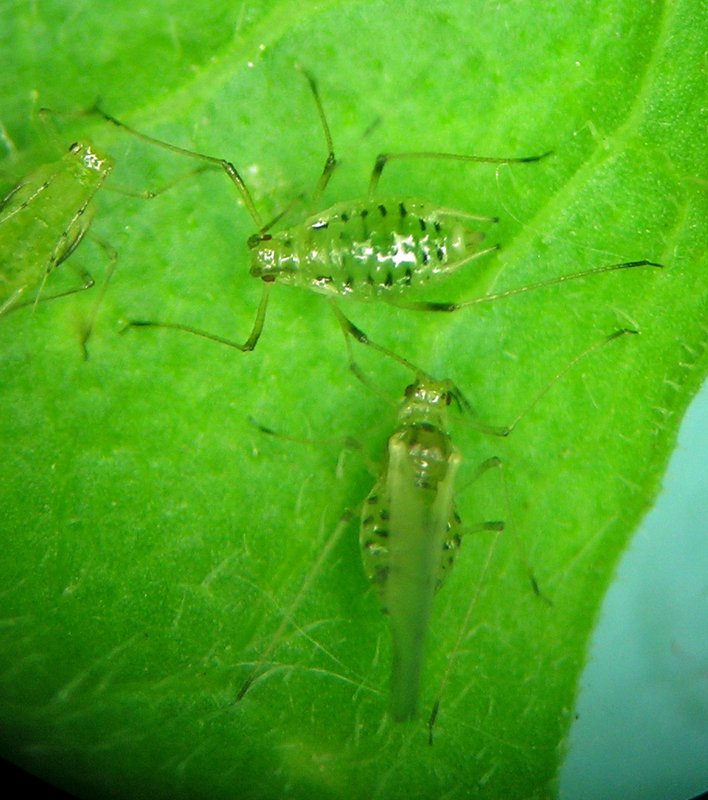 Nasonovia (Kakimia) aquilegiae aptera with reduced pigmentation. Nasonovia (Kakimia) aquilegiae alate vivipara on a colorful Aquilegia stem. I have seen what I think is this species quite a few times now across the western U.S. It was originally described from Arizona, which is thought of as a desert state, but there are plenty of forests there like the one from which the type collection was made. I collect this species on Ribes cereum from the sagebrush steppe to dry mountain slopes. It causes a strong leaf curl, and is often on the same plants with Nasonovia (Kakimia) houghtonensis group aphids and Aphis (Bursaphis). I have material from Idaho, Washington, and Utah. Nasonovia (Kakimia) arizonensis fundatrix from the Trinity Mountains in Idaho. 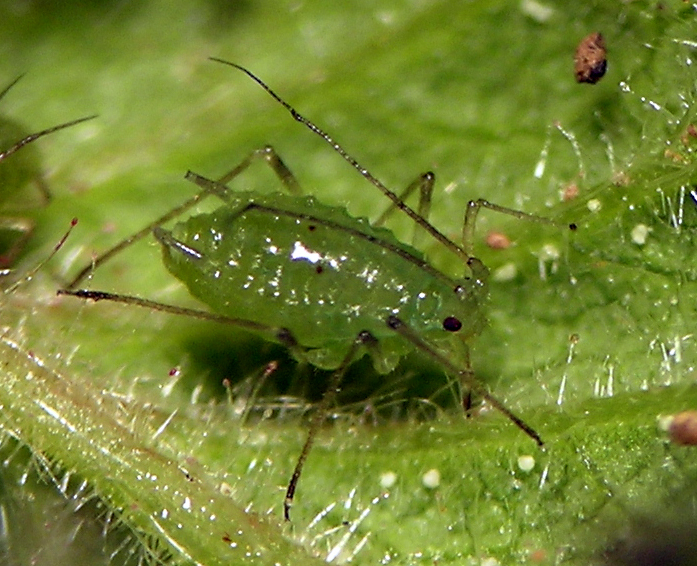 I started collecting fervently on wild geraniums a bunch of years ago because I wanted to find Macrosiphum species that feed on these plants. Instead, mostly what I find throughout the interior mountains of the west is N. crenicorna. It is very common on Geranium richardsonii and what I think is Geranium viscosissimum (turns out the two plants are very similar). It has an early sexual cycle, in July and August, mainly because the Geranium host plants are finishing up their life cycles at that time. I have material from Idaho, Utah, and Wyoming. For decades this species name has frustrated me because so many of the samples I have from Ribes seem to run to the ‘cynosbati’ region of Heie’s key. And then reading Heie’s discussion of the range of variation that he included under this species name, it seemed to me that the name had little utility. After analysis of my Kakimia material in early 2018, I feel better about the name. I now have a long series of slides that do actually seem similar in terms of taxonomy and biology, are different from something else I have grown comfortable with calling N. (K.) alpina (see above), and I have thus added the name ‘cynosbati’ to many of my Kakimia slides. At this point, I am applying the name only to specimens from Ribes, as I cannot see a clear connection between Ribes and any secondary hosts within the samples in my collection. I do, however, have this species from many different species of Ribes from quite a range of habitats, making me wonder still whether more than one species is involved and whether host alternation might still be discovered and confirmed. This is a very interesting and complex taxon, currently represented as five subspecies, a system boldly and courageously established by Heie in 1979. Nasonovia (Kakimia) houghtonensis group fundatrix on Ribes cereum in eastern Washington. I have never been much for subspecies — in my collection and my thinking either something is a species or it isn’t and I try to have fairly strict standards on the issue. The subspecies discussed by Heie seem to have different life cycles and perhaps host plant biologies. I agree that there are several probable life cycles among the samples I have collected, but I suspect adequate characterization would reveal full, reproductively isolated species. Perhaps Heie’s intent with the subspecies was to draw attention to this issue. 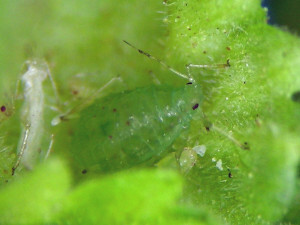 An enigmatic member of this probable species group is one that seems to migrate to Phlox speciosa as a secondary host. 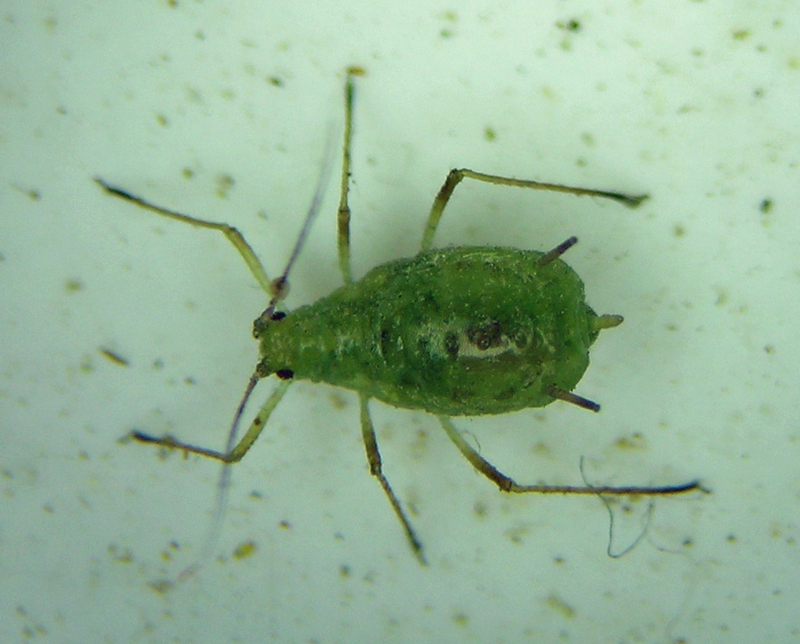 I have collected it here and there for several years, but have yet to make a firm connection between aphids on Phlox and any of the many “houghtonensis” group samples from Ribes. The seasonal timing of my samples from Phlox strongly suggest host alternation, but as of now the host alternation is unproven. I have this Phlox-inhabiting form from Washington in several places and from west-central Idaho. Analysis of my N. (Kakimia) samples from other Polemoniaceae (including a very small and strange species on a tiny low-growing Phlox), lead me to believe that they are all part of a ‘houghtonensis’ group. Heie suggests in his key that species such as N. (K.) collomiae and N. (K.) takala have siphuncular ornamentation different from N (K.) houghtonensis, but my samples of what I cam calling those species look much more like ‘houghtonensis’ than Heie reported. It is likely that there are heteroecious and monoecious species among my samples from Ribes and Polemoniaceae, but much more collecting of rare species will be necessary to confirm such assertions. My samples of the broader Nasonovia (Kakimia) houghtonensis group are from British Columbia, Alberta, Washington, Oregon, Idaho, Utah, New Mexico, and Arizona. 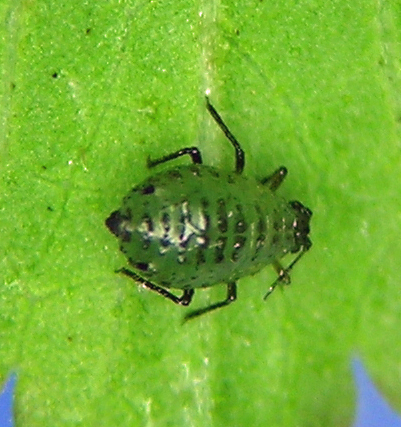 A probable new species in the broader Nasonovia (Kakimia) houghtonensis group that lives on Phlox. This is the only Nasonovia sensu stricto known from North America, and is apparently introduced here. It is heteroecous between Ribes and various plants in Europe, especially hairy ones, but I find it on Asteraceae. I so far have material from Germany, Switzerland, Czech Republic, Washington, Oregon, Idaho, New Hampshire, and New Brunswick. Nasonovia ribisnigri on Cichorium in southern Idaho. The alate vivipara is a bit teneral. 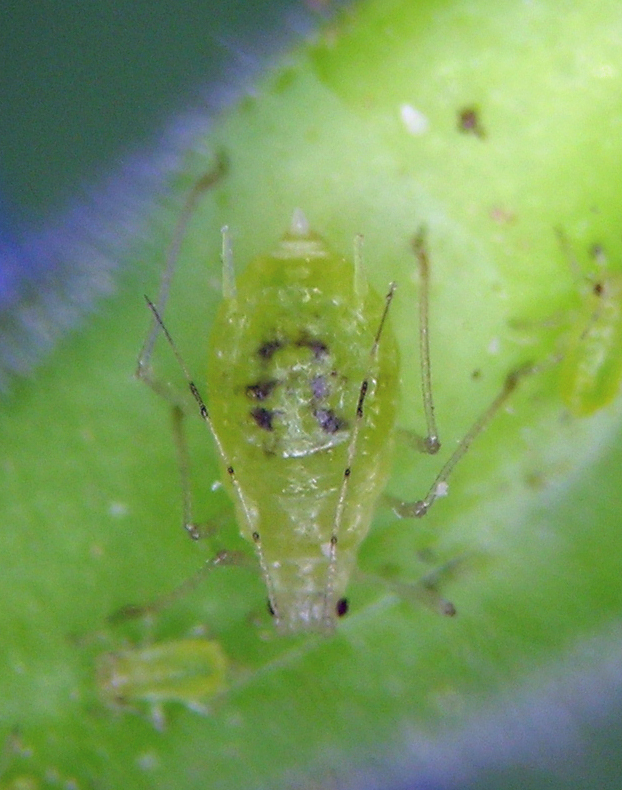 I find this aphid on Aconitum (monkshood) in the Rocky Mountains and interior mountains of the west, so far in Colorado, Utah, Idaho, and Oregon. 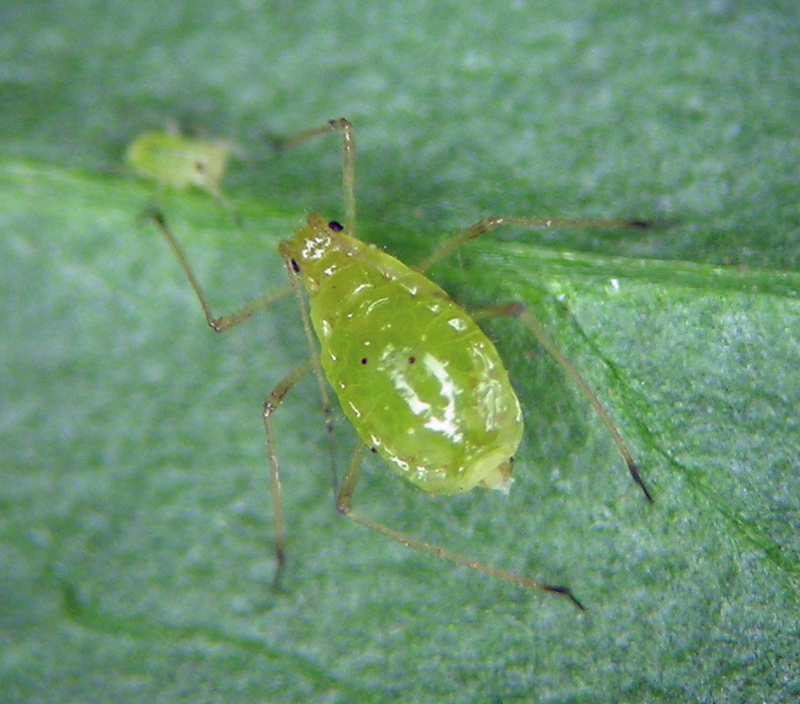 It is one of a few aphid species that I know of now that come in both a bright orange form and the darker green-brown-purple form (it can also be green). 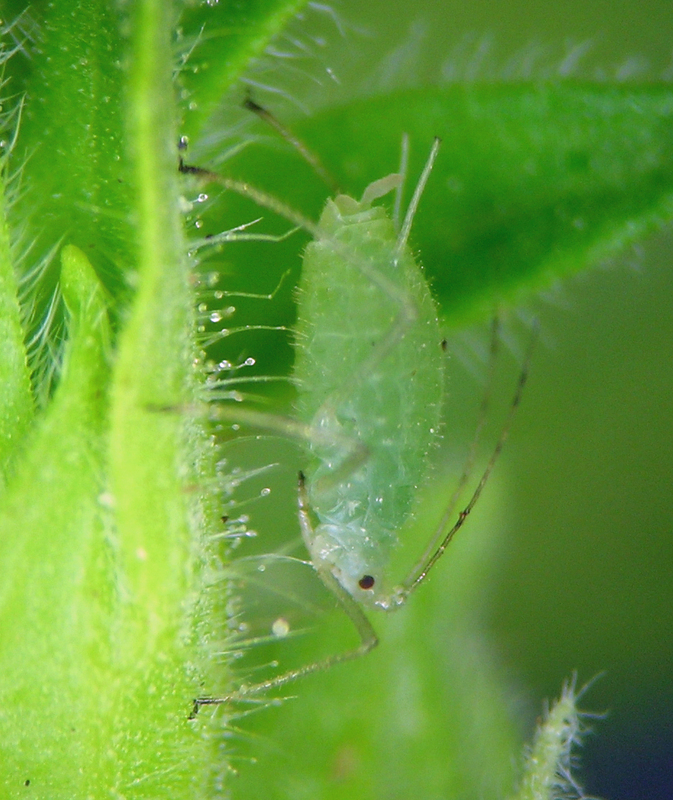 It can form very dense populations on its plants, but I also routinely find it in small numbers on the lower leaves. Nasonovia wahinkae orange aptera from the Blue Mountains of Oregon. Nasonovia wahinkae aptera darker color form, Blue Mountains of Oregon. Nasonovia wahinkae in its green color from the Eagle Cap Mountains of Oregon. This species seems to live without host alternation on Potentilla in western North America. 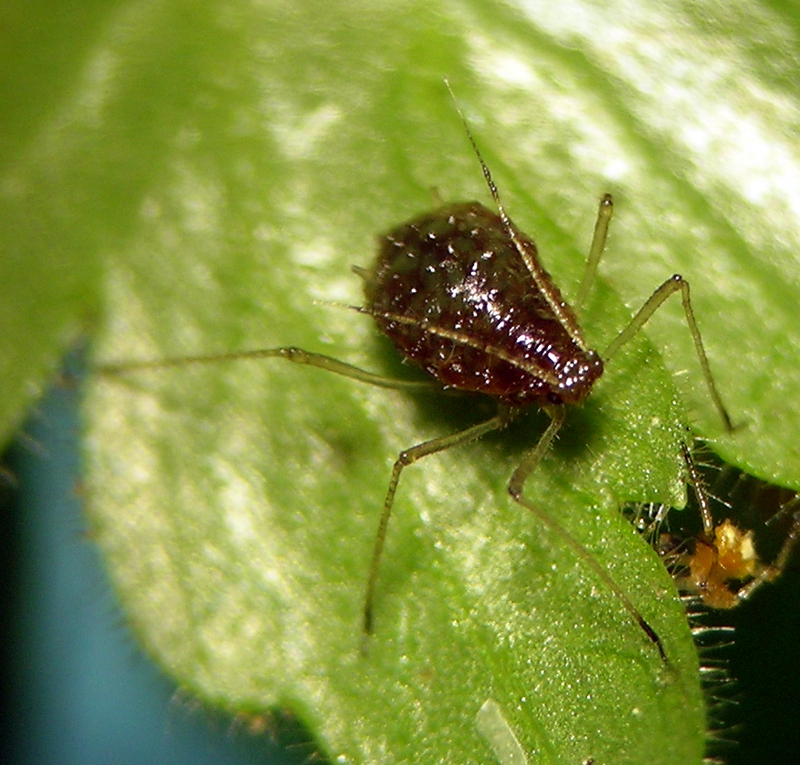 I walk past Potentilla on almost every collecting trip in natural systems out west, yet have only collected this aphid 5 times. If memory serves me correctly, I might have seen it a time or two in which I did not collect it for some reason. The leaf curl it causes is conspicuous (see below), making its presence easy to notice. It seems to be more common in southern Oregon and northern California than it is in Washington. Nasonovia (Kakimia) williamsi aptera from northern Idaho. Typical feeding damage caused by Nasonovia (Kakimia) williamsi.